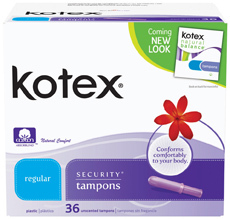 Hopefully You Did Not Purchase These Grey Market Tampons! Kimberly-Clark the manufacturer of Kotex tampons is currently embroiled in a lawsuit filed in Little Rock, Arkansas with Balcones Recycling, Inc., a recycling company based in the southwest United States. The complaint states: "Between October 2011 and July 2012, Kimberly-Clark utilized Balcones to dispose of at least fourteen (14) lot codes of Kotex Natural Balance Security Tampons that had been produced at Kimberly-Clark's Conway, Arkansas production facility, constituting more than one million individual tampons. Upon inspection of these tampons, Kimberly-Clark had determined that they did not meet Kimberly-Clark's product specifications and quality standards; accordingly, Kimberly-Clark utilized Balcones to dispose of and recycle them." Kimberly-Clark claims it "chose Balcones as its contracting partner because, among other things, Balcones utilized sustainable methods (in particular, materials that Kimberly-Clark provided to Balcones were to be recycled into fuel cubes that could then be used as a source of alternative energy) and assured Kimberly-Clark that its disposal methods were secure and not subject to interference." For its part, Balcones is denying the allegations and indicates that it assisted Kimberly Clark with its investigation into the matter, and also cooperated with the Food and Drug Administration (FDA) on a separate investigation. “Grey Market” sales of legitimate manufactured products are increasingly becoming a problem for manufacturing and distribution companies. The “grey market” refers to the sale of a commodity through a distribution channel, while legal, are unofficial, unauthorized, or unintended by the original manufacturer. The Kimberly Clark case is a great example of why “grey market” sales pose a serious threat to manufacturers and distributors. In this case the feminine health care products did not meet the company’s rigorous manufacturing standards. Since these products are inserted inside the human body, they pose a serious health risk to those consumers who are looking to save money through online outlets. From the Courthouse News article “consumers were purchasing products through interstate commerce that had been deemed unsuitable for sale and consumer use.” The suit identifies 14 lots of tampons totaling 1 million units. That is a lot of potential liability. Talk about a nightmare scenario, if these lots turned out to be toxic to those that purchased them. It is crucial for companies to protect their brand by turning to certified product destruction as a viable method of disposing of excess inventory, blemished lots, or expired products, particularly those that pose a health concern. Certified product destruction is a process whereby products are destroyed or disposed of and the process is authenticated in order to ensure that the product is not being resold or utilized illegally. A qualified product destruction company should provide at a minimum a certificate of destruction, but look for companies will go that extra mile and provide photographic or video evidence of destruction. You have worked hard to build your brand. Don’t let it be destroyed by unscrupulous opportunists that are looking to profit at your expense.